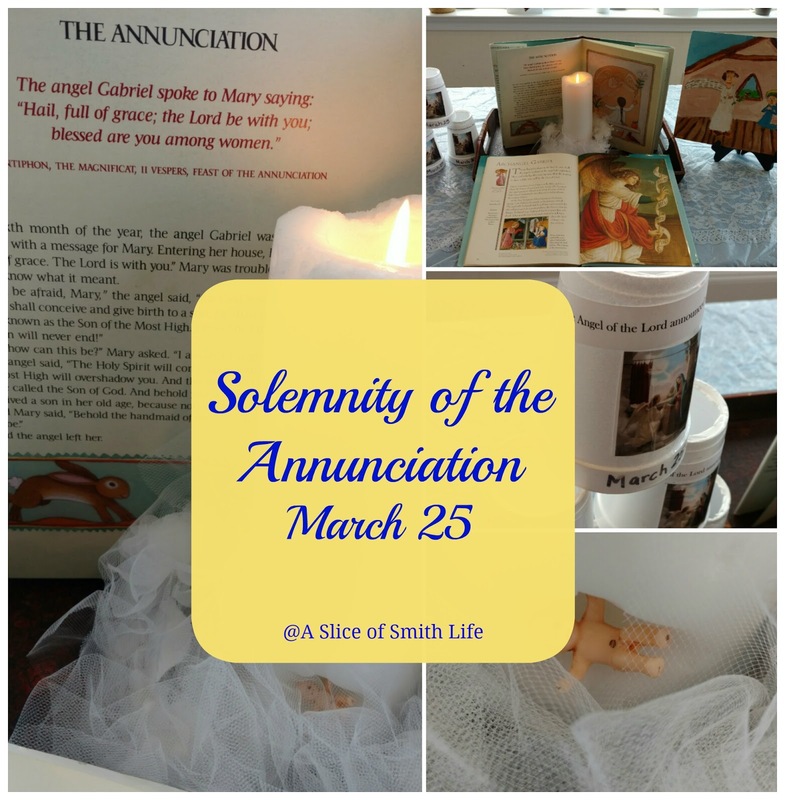 March 25th is the Solemnity of the Annunciation of the Lord when Mary said "Yes" to God's will when the Angel Gabriel told her the exciting news that she was the mother of the Son of God! 9 months from today is when we celebrate the birth of Jesus. We celebrated as in year's past with waffles for dinner (a Swedish tradition actually), "megaphones" to "announce" the Angelus prayer, and the table is decorated with a white candle with Baby Jesus cradled in the candle to represent how He was conceived by the Holy Spirit and lived in Mary's womb for 9 months. In the morning of March 25th, I set up our kitchen table like this.. I put the familiar plastic white lace tablecloth over a plastic blue tablecloth. I usually use these two tablecloths for Marian feast days because the lace looks "fancy", but it's a frugal decoration and the color blue is a traditional color for our Blessed Mother. 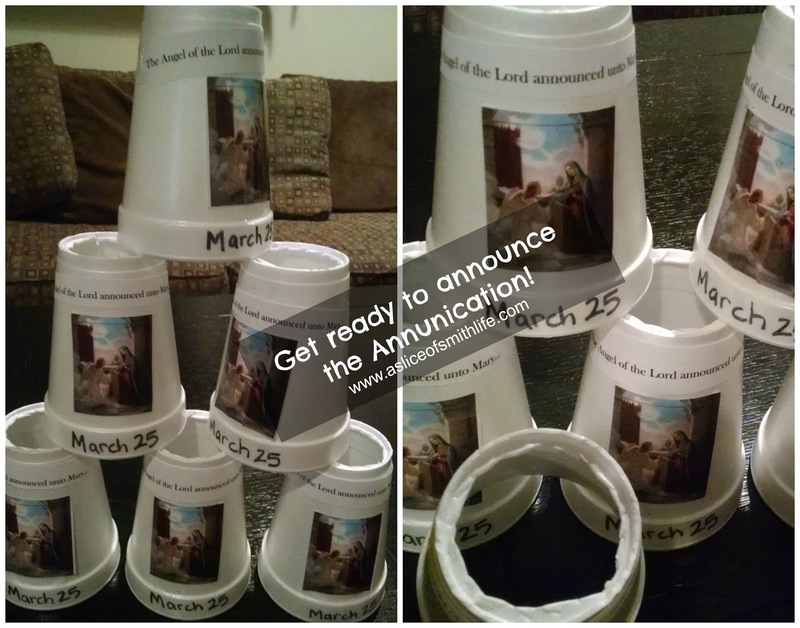 I made "megaphones" out of foam drinking cups so that we could "announce" the Angelus Prayer, which is a beautiful prayer about the Annunciation that we try to say each day at lunch time. 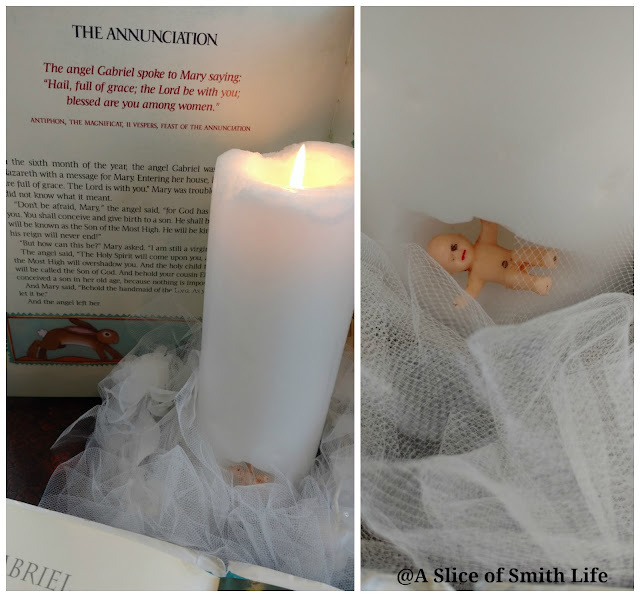 I printed out artwork of the Annunciation and the first phrase of the Angelus Prayer and taped them onto the cups. 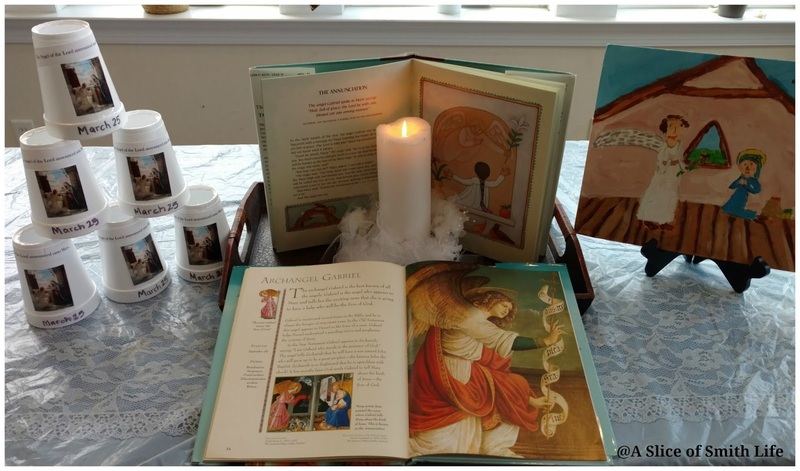 I displayed Mary: The Mother of Jesus by Tomie DePaola behind the candle. 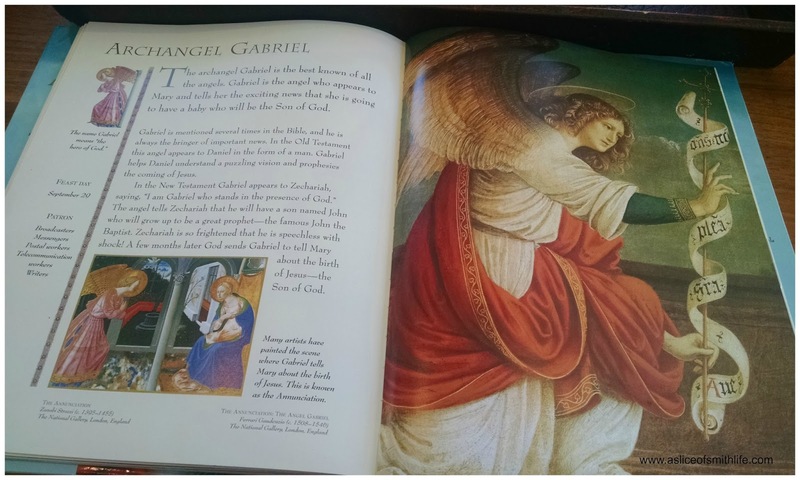 This book has a page about the Annunciation. I carved out a little hole at the bottom of the candle and put a plastic baby in it. This is the same baby we use for the King Cake at our Epiphany parties and Mardi Gras. The artwork on the right side of the Annunciation was painted by my oldest daughter several years ago that we have displayed in our home year round. 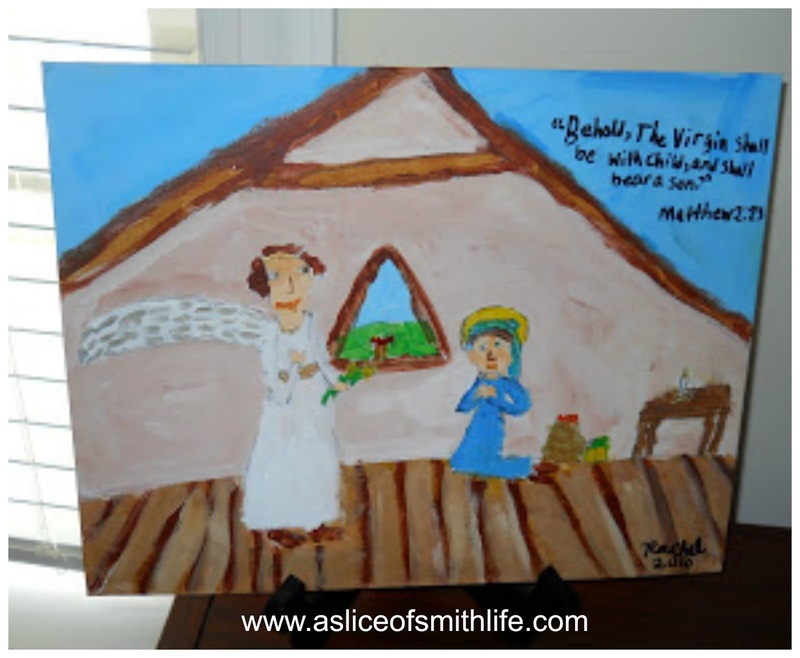 "Behold, the Virgin shall be with Child, and shall bear a son." We had waffles, bacon, fruit and homemade whipped cream for dinner because in Sweden the feast of the Annunciation is also called Waffle Day. It's interesting to learn why this is so! For a great reflection about the Annunciation be sure to read The Annunciation: When Angels Held Their Breath.